Pope Francis currently plans to visit Amman, Bethlehem and Jerusalem, May 24-26. This will be his second trip to Jerusalem. The Pope’s first visit was 41 years ago. On that trip, he arrived in Jerusalem in October, 1973, just before war began between Israel and its Arab neighbors. That war was fought between a coalition of Arab states led by Egypt and Syria, against Israel. The war lasted from October 6 to October 25. On his second trip to Jerusalem in May, 2014, there will be no war to interrupt the Pope’s journey. There is, however, a labor strike by Israeli diplomatic personnel which began this week. The unions are striking for higher wages and better working conditions. At first it was believed the Pope’s trip would be delayed or cancelled, since diplomatic personnel are needed to handle such a high profile visitor. However, Cardinal Pietro Parolin, the Vatican’s Secretary of State, has said that while the strike has caused “some apprehensions”, the trip will not be delayed. Despite objections from Israeli diplomatic personnel, the strike did not postpone a visit March 12-14 of British Prime Minister David Cameron, who arrived in Tel Aviv Wednesday. Cameron was accompanied by officials from 17 British firms, seeking stronger business ties with Israel. Cameron was expected to meet with both Palestinian and Israeli officials on the trip that had already been delayed because of flooding in Britain. The timing of the Pope’s May visit is intended to coincide with the 50th anniversary of Pope Paul VI’s visit, the first in modern times. Since that 1963 visit, two more Popes have come to visit, Pope John Paul II in 2000 and Benedict XVI in 2009. The Times of Israel reports that in October 1973, Jorge Mario Bergoglio, now Pope Francis, made his first visit to Jerusalem. Bergolio, then in his mid-30s, stopped in Jerusalem after completing training in Rome for his new job as the Provincial Superior of the Society of Jesus in Argentina. When the war began, Father Bergoglio was confined to the American Colony Hotel, in East Jerusalem. The Vatican recalls he spent his time “studying the Letters of Saint Paul to the Corinthians.” During his enforced stay at the American Colony, he read books he borrowed from the library of the Jerusalem branch of the Pontifical Biblical Institute. We may never know if young Father Bergoglio put aside his study of the letters of Paul long enough to cross the parking lot of the American Colony Hotel to visit the book store there. If he had done so, he could have discovered some important volumes about the political situation in 1973, and the history of the Arab-Israeli war that had started during his visit. It happens that a few weeks after that Arab-Israeli war ended in late October, 1973, I made the first of my more than 20 trips to the region. Like Father Bergoglio, I stayed at the American Colony Hotel. I was originally scheduled to make my trip at the same time as Father Bergoglio, but I waited until the war had ended. That is a choice I regret, if only because I missed my chance to meet the future Pope Francis. With no war to distract me, and no future Pope still in residence, a few weeks after Father Bergoglio stayed six days at the American Colony in 1973, I arrived at the American Colony Hotel. I was there because as the new editor of The Christian Century magazine, a trip was arranged for me (but not financed) by the American Jewish Committee. Like the future Pope Francis a few weeks earlier, I followed the usual Israeli-controlled schedule. Until, that is, with the help of an American Mennonite missionary stationed in Jerusalem I ditched my Israeli minder. One reason for my regret that I did not arrive at the American Colony when Father Bergoglio was there, is that had we been fellow residents in the cozy atmosphere of the American Colony, the two of us might have hit it off. We might have walked together across the parking lot to visit the book store a few steps from the front door of the hotel. At the book store, a longtime resource for visitors, we would have found books to study that were not confined to religious tomes, like Paul’s letter to the Corinthians. We might have found books that offered ways to connect Paul’s letters to the Corinthians to a military occupation. I speak here of books which force a reader to break free of the confinement of the institutional religious ghetto in which we religious types are easily tempted to hide. I wrote about my own first 1973 trip to Jerusalem for Link magazine. That 2000 essay, “On the Jericho Road”, may be found on Link’s website. In anticipation of the Pope’s May visit, the Vatican recalls that Father Bergoglio visited the “church-filled neighborhood of Ein Kerem”, which in 1973 had been converted into a Jewish colony for artists. Did Father Bergoglio wonder what had happened to the Christians who built those churches? Ain Karem is described on an Israeli tourist web site as “one of Jerusalem’s most picturesque neighborhoods in a peaceful valley between mountains and hills, surrounded by the beauty of natural groves”. “Like an island in a sea of green forest in southwest Jerusalem, Ein Kerem has charming stone houses adorned with arches, churches whose bells chime in the clear air and lovely paths paved with stone. It is only natural that a young Catholic priest would make two stops before being confined to his hotel for the rest of his 1973 visit, Bethlehem, where Jesus was born, and Ain Karem, where Mary met Elizabeth. On that visit Father Bergoglio would not have been told of the Nakba, which changed Ain Karem from a Christian village to a Jewish “neighborhood” of Jerusalem. In May, on his second visit, will he want to return to Ain Karem? He would find that the churches are still there, but few parishioners remain. I missed encountering Father Bergoglio by just a few weeks in the autumn of 1973. Had we been there together, we might have discussed earlier visitors who came to the American Colony. Those visitors included significant figures like T.E. Lawrence (“Lawrence of Arabia”) and Lowell Thomas, the American journalist who helped make Lawrence famous. Over the years I stayed in that hotel many times. I met a series of interesting visitors, like negotiators preparing for the Oslo talks. But, alas, I met no future popes. I would have liked to have included Father Bergoglio on the trip with my Mennonite colleague along the Jordan River. The three of us would have just fit in Leroy Friesen’s modest-sized vehicle. It is not a long ride to Birzeit and Nablus and back to Jerusalem. Israel’s checkpoint madness had not yet begun. Manufactured paranoia had not yet made travel in the West Bank so dangerous and oppressive. The only security barrier in the Jordan Valley in 1973 was a dirt road that ran beside the paved highway. That road was swept clean by IDF soldiers each morning. We were told the soldiers were looking for footprints made by unwelcome visitors from across the Jordan River. That was then and this is now. Pope Francis, no longer Father Bergoglio, will return soon to Jerusalem after a 41 year absence. He returns in a different status, bringing with him the enormous prestige and power of the Papacy. I seriously doubt that the Israeli authorities will put him up at the American Colony Hotel in East Jerusalem. Perhaps he will suggest a stop there, just for old times’ sake. When Pope Francis visits Bethlehem this May he will be exposed to the occupation wall. He will hear a different version of the impact of the Occupation from the people he meets in Bethlehem. It will not be new information but there is nothing quite like experiencing reality up close, even for popes. We will have to wait until late May to learn whether or not Pope Francis will use his moral power and the prestige of the Papacy to address the occupation. We will have to trust that the Pope will not confine his reading on this trip to Paul’s Letters to the Corinthians. Indeed, from what we have already learned about the social justice perspective of this Pope, it is even possible that in 1973 Father Bergoglio read more than Paul’s letters during his time at the American Colony Hotel. He appears to be a man who is curious and probing. It is also possible that a few fellow Catholic priests might have come by the American Colony in 1973 to talk with their colleague from Argentina about the harsh realities that were then plaguing the Palestinians. That was a time when the settlement projects were already well under way. Pope Francis could be an important player in the drama that is unfolding in the fading peace talks. He is certainly well informed about the increasing impact the Boycott, Divestment and Sanctions movement is having on Israel’s international standing. We will learn in late May whether or not that “very special spiritual bond” includes a greatly needed stern moral rebuke of Israel from Pope Francis. The picture at top of Pope Francis is from The Times of Israel. It is an AP photo by Alessandra Tarantino. 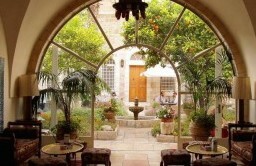 The picture of the American Colony Hotel garden, taken from inside the hotel lobby, is from Magister/Wikipedia Commons. The Institute for Research: Middle Eastern Policy, the Council for the National Interest, If Americans Knew, and the Washington Report on Middle East Affairs. A diverse panel of experts examined the relationship between the U.S. and Israel, and the impact of lobbying groups on U.S. policy in the Middle East. The day’s program was broadcast live on CSPAN Three. More than eight hours of informative observations, complete with questions from the audience, are now available on CSPAN Three’s web site. The name of each presenter, in the order they spoke Friday, is listed on the National Summit program. This entry was posted in Middle East, Middle East Politics, Religion and politics. Bookmark the permalink. Jim, I read your reminiscence this morning as my first reading of the day. You have presented your readers with a mesmerizing vignette of history, weaved the tapestry of important elements of the storied Holy Land’s recent events, and led us through magical geographical and personal journeys. I thank you as I wonder if there isn’t one of us who might, somehow, facilitate the slipping of your very important rumination under the door of Pope Francis’ bedroom. He could not read a better “prep” for his visit (which, in my dreams, will include a side trip to Gaza at his insistence). Truly, my heart aches when I consider the trauma that has been so cavalierly and so unnecessarily imposed on so many millions of human beings in the Holy Land, the region, and the world over the last 100 years. It is time for closure. I’m praying for Pope Francis I. He could single-handedly turn the arc of history. Will he? 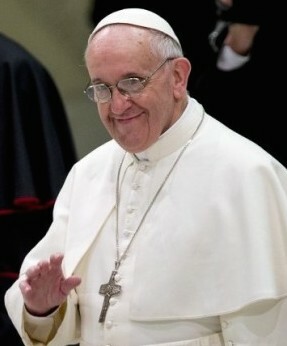 A recent article reported that Pope Francis is showing interest in the liberation theology movements. Whereas John Paul II regarded these movements as too Marxist, Francis has supposedly taken them up again. We’ll see. The national summit on the7th of March at the National Press Club in Washington D. C,could not have happened in Europe. It reveals that the United States has the largest and most distinguished intellectual and political movement in the world in opposition to the disorders in the Middle East caused by hardline Zionist governments in Israel. I hope that anti-American demagoues abroad will take note, because this movement is a wave of the future which will change the direction of the United States in the Middle East as decisively as domestic opposition forced the high and mighty in Washington D. C. to end the Vietnam War. Betty and I have read Jim Wall’s current commentary with more than the usual interest. We lived in Jerusalem and Bethlehem for three and a half years and spent time with Jim on several of his visits. Then after we returned home, we arranged for a group of journalists, with Jim as the leader, to talk with key persons (including Yassir Arafat) in Israel and Palestine. We certainly share Jim’s efforts to see justice done and peace reign in that whole region. No doubt Pope Francis will have heart-to-heart talks with Christian leaders in Jerusalem and the West Bank, nearly all of whom now are–appropriately–Palestinians. The Holy Father is also likely to meet with important Muslim leaders. We know from our own experience there that he will be welcomed with open arms by Palestinians in all walks of life. Jim, I truly enjoyed your reminisce about your first trip to the Holy Land and how you almost met with Father Mario Bergoglio. I have no doubt that, if that meeting would have taken place, Pope Francis will now have a truly in-depth factual knowledge and feel for the Israeli colonization of Palestine. My hunch is that the Israeli head-hunters are now deeply investigating Father Bergoglio’s stand regarding the heinous bombing of the Jewish Center in Argentina in 1996. it will be intriguing to see how the Israelis will tie that incident to the “Iranian suspects”, and Netanyahu’s demonization of Iran, and its alleged pursuit of nuclear parity with Israel. Netanyahu will spin all his rhetoric around Iran and prevent the media from focusing on Israel’s occupation of another people, Israel’s apartheid state, illegal settlements, illegal Zionist American and Russian settlers in East Jerusalem and West Bank, and Israel’s criminal monopoly of the only nuclear arsenal in the entire Middle East. I hope that Pope Francis surprises us by taking a look at the strangulating structure, built by the evil Neo-King Herod, surrounding Bethlehem, and as he addresses the crowds, he cries out in outrage, “Mr. Netanyahu, tear down that wall”. No, the Pope will certainly be put up somewhere else this time. Bethlehem will be a challenge for his hosts as the wall intrudes just about everywhere. Let’s hope that the recent Sabeel campaign to end the incarceration and scarification of Palestinian children will be at the front of the Pope’s mind along with Paul’s letters. Mabruk, Jim Wall, for a truly lyrical piece of remembering and reporting. I’d love to meet you at the downstairs Colony bar over a martini! with or without the Pope.